Upcycling is so much fun and can produce such satisfying results! This bureau style desk was originally my mothers when she was a child. However over the years layers of thick gloss paint had been applied to it and it had really seen better days. A few years ago my parents even tried selling it for a mere £5 at a car boot but nobody was interested. So the (self appointed) challenge arose for me to give some new life to it (with the hope it could be used by Martha when she is bigger). The thing i particularly liked about the desk was its small scale and the separate compartments. The compartments will be fun for Martha to hide things away in and arrange special keepsakes. 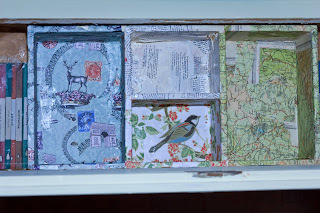 I collected a number of different papers including some old wrapping paper, maps and books to collage directly on to the desks surface. I was really pleased with the Penguin book wrapping paper which I used on the shelves. 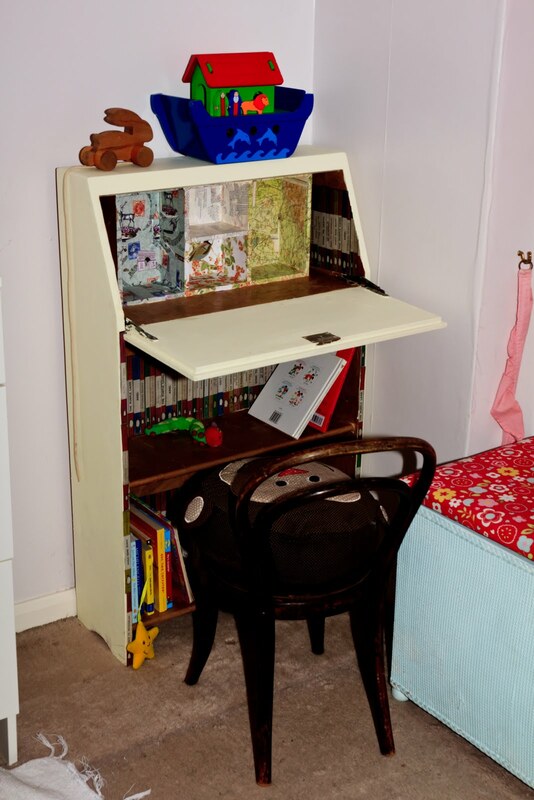 It has now been transformed into a fun piece of furniture perfect for Martha's room.